As part of Quennell Rothschild's master plan for the Rockaways, WXY Architects was tapped to design the beach pavilion and two shade shelters. The pavilion will be open to the public tomorrow, Wednesday, July 18, with a ribbon cutting set for later this month. A wave-like roof flows from a utilitarian box enlivened by glazed brick stripes arranged in muted shades of mint, lime, and hunter green. Circular openings are punched into the roof covering a large outdoor boardwalk made of recycled plastic. The structure servers as a comfort station, park maintenance station, and an outdoor classroom. Kids can kick back on precast concrete seating that conjure up a Hanna-Barbera cartoon. The flowing rooftop is cast-in-place concrete painted with tank liner VersaFlex. The end of the structure culminates in a 15-foot cantilevered sweep upward, giving the appearance of a towel flapping in the wind. Rarely do red plastic coffee stirrers conjure notions of Walden Pond, but for architect Brian Ripel and artist Jean Shin, the notion is not that far fetched. 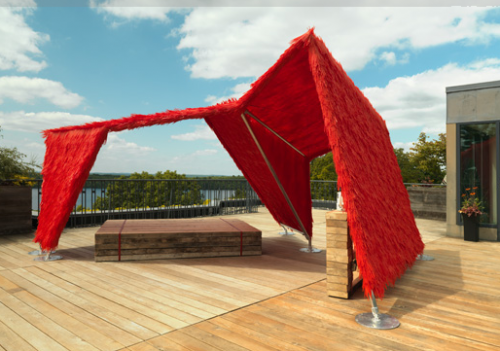 The duo's Tea House rooftop installation at the deCordova Sculpture Park and Museum in Lincoln, Massachusetts sits about a mile from Thoreau's retreat. Ripel pointed out that the connection is somewhat difficult to discern in isolation, but the gabled pavilion frames pristine views absent of any evidence that the museum sits a mere twelve miles from downtown Boston. While the project took two years to conceive and engineer, construction took only three months. The thatch-like canopy is made up of 12 by 24 inch shingles of stirrers sewn together with an industrial sewing machine. Approximately 250,000 stirrers make up the shaggy shelter. The aluminum frame mimics the gables of nearby rooftops and re-purposed lumber was used for the tea bar and seating plinth. Visitors will be served free tea and the discarded teabags will be used in the second component of the exhibition that opens in the fall. The teabags will form hanging chain models for an installation called Retreat that will remain on view through the end of the year. Until recently, the only way to enter Central Park's oldest and largest playground was through a chain-link fence. 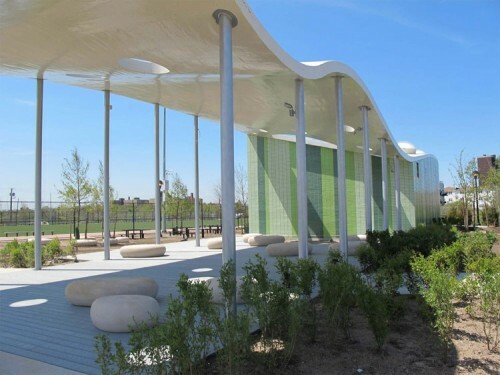 The great Heckscher Playground, impressive in scale and amenities, did not have an entrance to match, but a recently completed renovation to the building has retuned the structure to it's original use with a contemporary twist blending the building's history with contemporary needs. In 1926, an entrance gateway, similar to many classically-adorned brick breezeways in other New York City parks, was constructed concurrent with Heckscher Playground but did not last long. While Fredrick Law Olmstead's design for Central Park provided huge swaths of public space, there remained a need for maintenance areas, and the original entranceway was enlarged and the transversal passage enclosed. 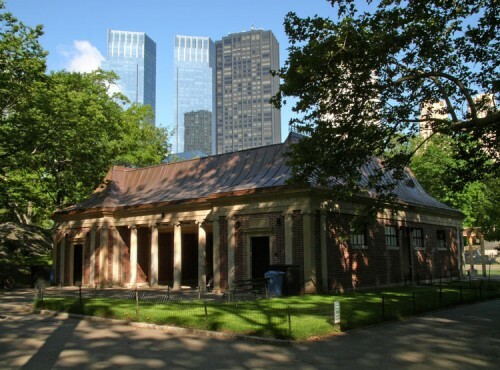 The Heckscher Building, with an arched copper roof and flemish bond brick, sat uninvitingly as a maintenance shed at the top of Heckscher Playground until 2004, when the Central Park Conservancy approached several architecture firms with a commission. The Conservancy wanted to retain the enclosed support space while restoring the breezeway entrance into Heckscher Playground. 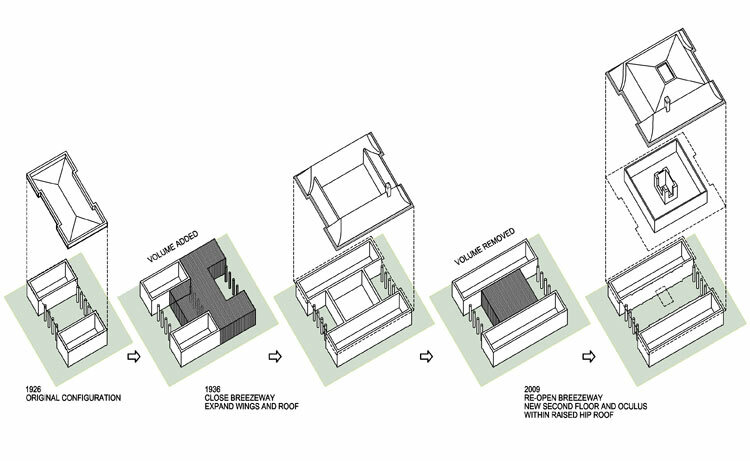 After consulting with several firms, Salam & Giacalone Architects was selected to design the building's renovation. The design posed several challenges to the architects. The Heckscher Building was designated a Scenic Landmark in 1974 as a part of Central Park. Under New York City Law, the "aggregate landscape features" in the park are under the control of the Landmarks Preservation Commission meaning the building with 1936 renovations was protected as well. Because the original playground gate had been significantly altered before landmark designation, restoration of a portal would need to respect both the original 1926 design and the 1936 enlargement while still addressing contemporary needs of the Conservancy. Another primary challenge for the architects was combining the two programmatic requirements: recreating a"portal for the playground" while preserving much needed space for maintenance staff and equipment. To preserve and renovate the exisiting structure, Salam & Giacalone raised the maintenance space to the second floor, opening space in what was once the original 1926 breezeway. The second story is hidden behind the copper roof and accessible by stairs, requiring a steel frame throughout the building for structural support. The Landmarks Preservation Commission, concerned with the appearance of the "relationship of the building to the historic landscape," prevented installing exterior windows on the second floor. To bring natural light to the new space, the architects created a central light-shaft they refer to as an "oculus," which also lights the passageway below. The interior passageway is decorated with ornamental pilasters, modern abstractions of those on the exterior. The Venice Biennale is staged in an enormous old Arsenal building and in an urban park a few blocks away that houses 30 national pavilions. The first of these pavilions opened in 1907 and several were designed by famous architects like Josef Hoffmann (Austria), BBPR (Canada), Alvar Aalto (Finland), and Sverre Fehn (Nordic). The United States pavilion was designed by William Adams Delano. There have been very few buildings built in the garden since James Sterling designed the biennial book store in 1991, but just behind the U.S. pavilion the Australians are building a new exhibition space designed by Denton Corker Marshall. The Australian architects describe the pavilion as a simple structure or "a white box contained within a black box." 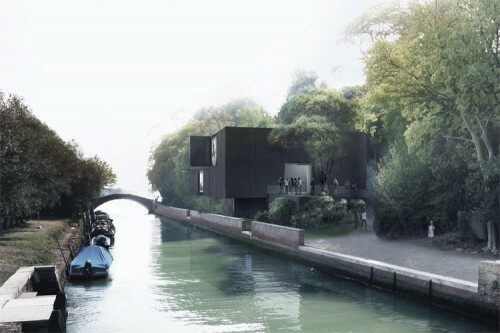 The pavilion will open in 2015 for the 56th art biennale and its $6 million price tag will be paid for with private funds. Coca-Cola has big plans for an Olympic Park pavilion for London's 2012 sporting extravaganza. London-based architects Pernilla & Asif have created the "Coca-Cola Beatbox," a spiraling structure clad in red and white panels that appear to be suspended in frozen animation. It's not only an intriguing structure but an interactive musical instrument. The experimental architecture works with cutting edge sound technology, encouraging people to interact and "play the pavilion." Inspired by sounds of the Olympic games—the plunge of an archer's arrow into a target, athlete's quickened heartbeats, squeaking sneakers—the Beatbox will be imbedded with sound-bites created by Grammy Award-winning producer Mark Ronson that allow visitors to remix their own mashed-up productions. Parnilla & Asif have designed a floating, divergent panel system that encapsulates a spiral ramp, leading visitors to the roof for a panoramic view of the Olympic Park. Sound and light reflect off of the panels, creating a sensory and aural experience that may be difficult to discern from renderings, but Coca-Cola is sure that its impact will be felt: “With the eyes of over four billion people on London next year, we want to use our long-standing association with the Olympic Movement to shine a spotlight on Britain’s brightest stars and inspire young people to pursue their passions." Design Miami, the high-design fair that runs with the giant, Art Basel Miami Beach, exhibited two objets d’architecture over the Miami Art Week, and named an architect, David Adjaye, as its 2011 Designer of the Year. 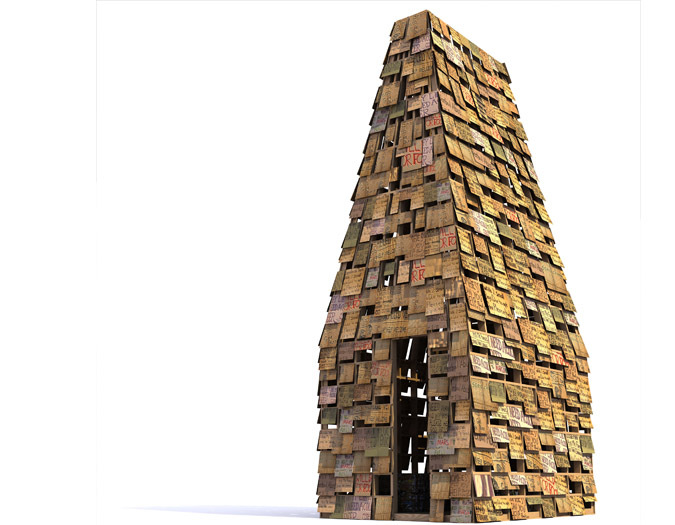 Both objets were sculptural pavilions: one is an installation by Adjaye, commissioned for the fair, and the other a restored modernist icon with a utopian agenda. Adjaye’s pavilion Genesis was sited just outside the entrance to the Design Miami fair tent. Constructed with digitally cut timber planks, Genesis is triangular in plan, with an ovoidal interior space that opens to two sides, a smaller window on the third side, and an oculus above. 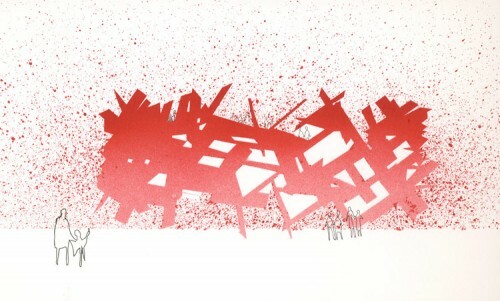 Called by Adjaye “architectural furniture” because it’s not exactly a building, but almost a sculpture meant for human occupation, Genesisbecame a civic amenity for fairgoers, and gave the parking-lot site a feeling of a plaza. The other pavilion was in a vacant lot in the Design District. Buckminster Fuller’s Fly’s Eye Dome prototype was an early experiment in inexpensive prefab shelters and environmental, off-the-grid living. The dome, one of only three ever made by Bucky, was restored by Design Miami’s founder, Craig Robins. It was joined by the Fuller’s “omni-directional transport system”, the Dymaxion 4, restored by Lord Norman Foster using his own original Dymaxion as template. The 24 foot-wide prototype dome is a tessellation of hexagonal fiberglass panels with plastic bubble dome windows that seem to radiate from refracted light. It appears strong, but lighter than air, as if a white cloud of geometric purity is floating just along the ground. It was paired with Fuller’s Dymaxion Car as part of the traveling exhibition, “Architecting the Future: Buckminster Fuller and Norman Foster” curated by Lady Elena Foster (Long before he was knighted, Foster worked with Fuller.) The dome will be permanently installed in Miami’s Design District, in a plaza being developed by Robins. The Miami fairs have always been cross-disciplinary, beginning in the early years with the spontaneous creation of the “Miami model”: part serious fair, part social event, part bacchanalian party, part educational experience, and part clearing house for other creative media. Design Miami showed how naturally design-as-art can fit into this maelstrom. 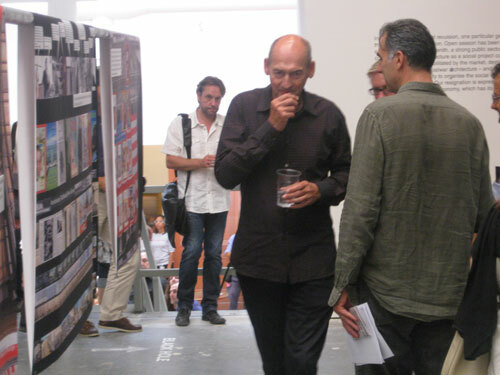 Perhaps architecture, although it has always played a cameo role during Basel week, will move in the same direction. Sometimes it seems like our world is peopled entirely by yesterday’s and tomorrow’s Designers of the Year. But at least DesignMiami’s Global Forum for Design’s Designer of the Year Award comes with a nifty commission. 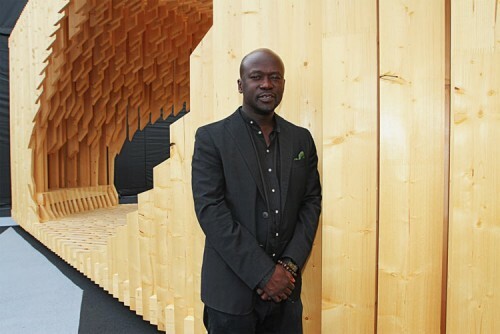 This year the honor goes to David Adjaye and he will be designing a site specific installation for the entrance to the fair’s temporary structure on Miami Beach, open from November 29 through December 4. Adjaye will have no trouble following in the footsteps of past honorees including Zaha Hadid, Marc Newson, and the Campana Brothers. He is an old hat, as well, at devising cool pavilions. His mesmerizing minimal installations made in collaboration with Olafur Eliasson and also with Chris Ofili have been stand-outs at past Venice Biennales. His multi-media Nobel Peace Centre in Oslo, a permanent installation, is as much event as architecture. For MiamiDesign, the architect has designed Genesis that is described as being made of hundreds of vertical wood planks that—thanks to CNC milling—devolve into organically fluid seating with views to the sky. Last year’s Designer of the Year was Konstantin Grcic. His piece, called Netscape, was a steel shed with impressively twisted slats full of hammocks. And the year before that Maarten Baas from The Netherlands played off the Dutch tradition of a cabinet of curiosities, only his was large enough to hang-out in and admire the designer’s own collection of thingies from around the world. As the folks down in Miami know so well. The best part of having a Designer of the Year in the house is the chance to party. Oh, yes, and a pavilion with someplace to sit. 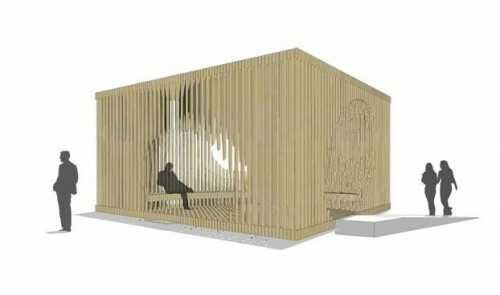 This year’s Serpentine pavilion by Swiss architect Peter Zumthor opens on Friday, July 1. The first images reveal not just a simple structure of humble materials but also a new type of collaboration for the Serpentine series. 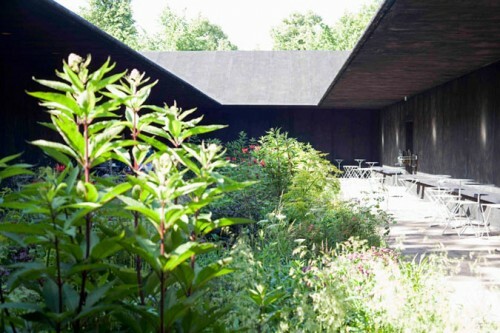 Zumthor invited the Dutch planting designer Piet Oudolf to join the project, and although Zumthor retains top billing, his design gives Oudolf center stage. Oudolf recently shared a plan with us of his vibrant garden scheme that forms the heart of the timber-frame structure. Oudolf’s garden is in the center of the pavilion, whose walls are wrapped with burlap and coated in a grainy black paste. Visitors enter through doorways staggered along a set of exterior and interior walls, moving from the dark, shadowy hallway into a bright, flower-filled atrium that is open to the sky, with Prussian blue benches running around the perimeter and scattered folding chairs and tables designed by Zumthor. Over 20 varieties of densely packed plantings, from elegant irises to untamed grasses, will grow to various heights, said Oudolf, with some chosen to add “vertical accents” and act as a screen, alternately obscuring and revealing activity on the opposite side of the atrium. And while the blooms will be visually arresting, they will not be overly fragrant. “Scent attracts bees and insects, so we really thought of scent as secondary rather than as a key part of the design. There is scent of course, but it’s just a backdrop to the experience,” said Oudolf, noting that the 1200-square-foot garden should comfortably accommodate 30 to 40 visitors at a time, and that the multiple entrances will ensure easy circulation around the garden bed. Oudolf said that Zumthor, who received the Serpentine commission last October, contacted him in January while visiting the Netherlands. The two had never worked together, but “He already knew he wanted to do something that created a particular atmosphere, and he had an idea for a kind of closed pavilion with a garden inside,” said Oudolf of Zumthor’s concept for a “hortus conclusus”—a secluded garden within a garden. 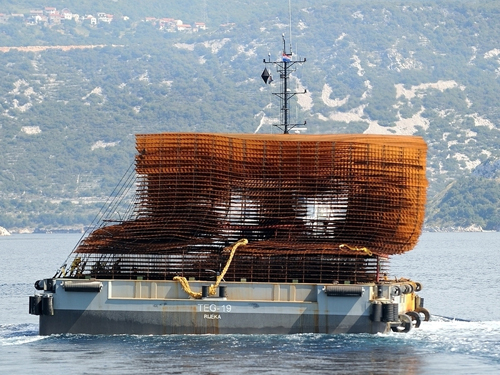 Julia Peyton-Jones, director of the Serpentine, said the project “brings to mind Zumthor’s Bruder Klaus Chapel in Germany, which he’s called ‘a small space to be quiet,’” while co-director Hans Ulrich Obrist compared the context of the Zumthor-Oudolf collaboration to a Russian matryoschka doll: the pavilion garden sits within the larger grounds of the gallery, which itself is tucked into Kensington Gardens. Oudolf is best known in the U.S. for his planting design for the Phase I of the High Line in New York, where an unmanicured mix of indigenous grasses and flowers almost appear to grow wild. While the plants differ, Oudolf said that his garden for the Serpentine has a similar “unorganized, spontaneous” effect. For more details on the opening, check out Daniel Ayat's on-site coverage. 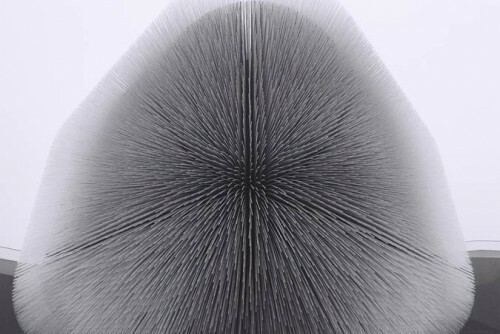 British architect Thomas Heatherwick was recently featured on a Ted Talk where he presented five projects including his Seed Cathedral from Shanghai's Expo 2010. The pavilion incorporated thousands of seed-encapsulating plastic rods that transmit light into and out of the building. Taken as a whole, the strands resemble one giant occupiable seed puff.